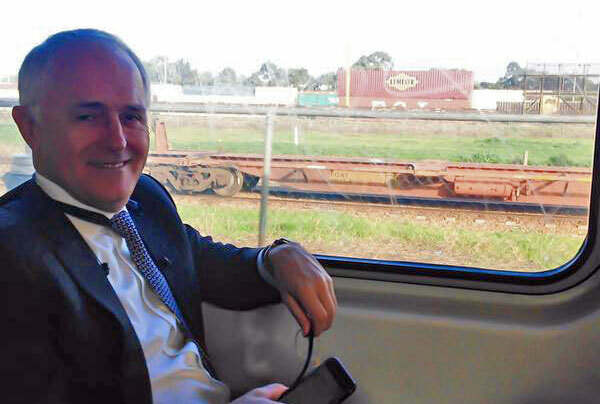 Australian Prime Minister Malcolm Turnbull, who likes to document his public transport patronage. One thing that’s certain about new prime minister Malcolm Turnbull is that he understands cities, the need for density and better planning. He also gets the nexus between these elements and equity as reported in these pages in 2013. But like the challenges he faces on prosecuting a strong climate agenda, which he also gets, can Turnbull transmit this understanding to the cabinet and new policy at the federal level? The most telling moment after the Liberal leadership spill on Monday night for anyone interested in climate policy was when new PM Malcolm Turnbull was asked during his press conference about possible changes to policy substance. He hesitated. Just a fraction, and just enough to reveal a man at least partly conflicted. Of course he would want change to policy. Significant big change. Despite what he claimed, the foul mood of the electorate that helped Turnbull topple Tony Abbott as PM was not because it didn’t understand existing policies – it hated them. Changes to policy would occur, of course they would, but with consensus and in a collegiate and collaborative manner, said the PM designate. Someone in the press room finally asked about climate policy. This time Turnbull was prepared. It was a policy he had supported as minister and he would support it now. Julie Bishop, forever deputy leader and re-elected in the role, seized the opportunity to firmly say Australia had set its targets for the COP Paris talks in December and these would remain. Let’s stick our neck out here and say this is one of the policies Turnbull will probably change. The same goes for the policies on cities (absent), on clean energy, energy efficiency, and transport, environment, science and technology (negative and destructive). Turnbull won the ballot last night precisely because he shows a more humane and rationale face that Abbott. Also a more courageous one. So he needs to change policies. But above all the beasts that terrorise politicians in the dead of night, it’s those within that should be most feared. The right wing of the party despatched Turnbull quickly and smartly when he wanted to support an emissions trading scheme under the Rudd government. The move to get rid of him and stop the ETS ignited one of the most intense and aggressive media and public relations campaigns in modern times. In Australia at least – but in synch with the American right that supported this move – it unleashed the dogs of war on climate science. But he won’t survive the electorate unless he changes the policies radically. Better selling or explanation – or spin – of the previous policies won’t cut it. The image of the now almost-certainly former treasurer Joe Hockey dancing and smoking his cigar as he handed down one of the most brutal budgets ever is forever seared on the voters minds. In the sustainability industry and the many sectors that should now be in full bloom on climate response and resilience, but are not, there has been shock, followed by anger, then white hot anger, then despair, and a kind of existential apathy after searching for the logic, even a financial logic in government actions, and finding none. Because everything about climate response makes sense, and it makes money (given the right timeframe). Because without a response to climate change and buildings and cities that work for us, we won’t have a place on which to house an economy. First, do nothing. Wise move. Next, think about an early election. Wait for the a few bounces in the polls then go in November, as several commentators have suggested. This provides the consultative, collegiate, collaborative scope for new polices. All Turnbull has to do in cabinet is point to what happened to the last lot under the existing policies. So in a nutshell it would be no surprise if the sustainability industry was not feeling a little buoyant today, not quite as buoyant as the big end of town is reported to be. But certainly more buoyant than anyone has felt for more years than they care to remember. Certainly in the energy efficiency sector. Rob Murray-Leach, former chief executive with the Energy Efficiency Council and now back on board as executive, policy and advocacy, was reasonably upbeat on Tuesday afternoon, but understandably still a bit cautious after what he’s witnessed with his membership over the past few years. “It’s not clear yet in terms of policy change whether Turnbull will lead to a significant shift in policy and certainly he’s made it clear he will look to engage cabinet,” Murray-Leach said. What was clear was that Turnbull has a seriously sound understanding of the energy markets, the disruptions for energy under way from technology as well as what was needed in terms of reform to create a more stable platform for investment, Murray-Leach said. “When we’ve met with Turnbull he’s shown he has a deep understanding of energy market issues. (And it’s perhaps revealing that though strongly referenced in his victory address, the word energy was not mentioned). Maybe it won’t be such a substantial shift, Murray-Leach said, but what bodes well is a more bipartisan approach. In Victoria, where the EEC is headquartered, the mood is already on the up following the ascension of the Andrews government, which has signalled strong support for sustainability and energy efficiency. Observers have even started to expect the Greener Government Buildings Program could be resurrected, given the government requested a briefing on the program ahead of its budget. Analysts Reputex in a mid-afternoon alert agreed the view over the longer term differed from the short term. Reputex also said sticking to the climate script is designed to “head off concern from the conservative right within Liberal party room”. On Direct Action they say there’s an opportunity for policy adjustment, with the consultation over the newly released Safeguard Mechanism draft rules. On the long game Reputex expects much better news especially as the new PM heads to an election with a new set of policies that could provide “a specific mandate to strengthen the government’s emissions and renewable energy policies”. In May 2013 we reported an appearance by Turnbull at a Grattan Institute seminar on cities to advocate for better transport, where he said Australia had “tragically” neglected transport infrastructure, particularly public transport infrastructure. It was a social justice issue, he said, and added that density, coupled with good amenity, was the solution, not the problem. His grasp of the nexus between these issues and property is impressive. He was good on innovative finance as a solution. “Don’t you think that one of the problems we face is that we have not worked out a satisfactory way to finance public transport infrastructure… to capture some of the accretion in land value occasioned by the development of that transport infrastructure?” Turnbull asked a NSW Treasury figure. “Because it does seem to me that we’ve forgotten something that we once knew,” he said. He also supported moves to increase density in cities. Complaints about population and immigration usually boiled down to issues of congestion, he said. It’s worth reading this story in full here quoted by Urban Task Force chief executive Chris Johnson in a media statement reported in The Australian Financial Review. In a way so much is about sentiment. In Australia the mood over the past several years has been miserable. In climate, in sustainability, worse than miserable. But in the economy too. But why? For no good reason, actually. A string of visiting leaders from New Zealand’s John Kay to Barack Obama have wondered what could possibly be wrong with all the downbeat assessments. Mood disorder? The bit about Turnbull’s speech that was really interesting is that he used the word “exciting” to describe Australia’s future and our opportunities. We can’t recall Abbott ever using the word exciting to describe our world. His words and speeches referenced fear and insecurity. “We have to recognise that the disruption that we see driven by technology, the volatility in change is our friend if we are agile and smart enough to take advantage of it. It was Keatingesque in range and vision. (Ironically, or not, the ABC played the brilliant interview of former PM Paul Keating by Kerry O’Brien as soon as the leadership coverage closed). Turnbull is driven by ambition and it’s quite amazing to hear him talk about an exciting future, and Australia’s chance to seize the opportunities and leadership. It’s been a long time since we heard those words in relation to Australia and our opportunities. At this time we need them more than ever. With any luck the change of leader has snapped the axis of depression and misery that has plagued Australian politics since Tony Abbott took the Liberal Party leadership from Turnbull in 2009, and will allow a positive nature to emerge. So almost regardless of whether he wins the next election or not, what’s possible is that we can get back to a bipartisan position on climate change and sustainability. Which is what so many people in this space are all about. The challenge for the ‘great communicator’ is to persuade his Liberal and National Party Coalition that climate change is real and direct action is not! The rest of us need no such persuasion. Yes, I absolutely agree with the previous comment – wonderful and engaging commentary Tina! You have expressed so well the feeling which I felt too when I heard the news and heard Turnbull’s speech. thanks so much Shaila and Ngaire !